A seasonal offensive of festive spirit. In 2009 the Royal Opera House presented the Tales of Beatrix Potter alongside Les Patineurs for their Christmas double-bill. This year it is doing the same only for three of the performances (14, 16 and 18 December) the skating ballet is being replaced by Peter and the Wolf. As last year more than proved Beatrix Potter is a major charm offensive that seems almost guaranteed to put audiences in the festive spirit. Short of the cast forgetting to grace the stage entirely, a performance is virtually guaranteed to come with a recommendation. The question is not so much whether to see it, as which ballet to see it with. To say that Peter and the Wolf is the choice for children is slightly misleading. There are adults who will take to it, just as there are youngsters who will enjoy Les Patineurs. But Matthew Hart’s take on Prokofiev’s 1936 creation, which was a hit when it premiered in 1995 but has not been seen since 1997, does seem particularly suited to the little ones. It has a clear narrative, with one dancer actually telling the story, and highly accessible leitmotifs, with most characters being captured on a single instrument. On its own terms, the piece can hardly be faulted. Like the original 1995 production, it features a wealth of highly talented youngsters from the Royal Ballet School. Kilian Smith as Peter has immense stage presence and puts an abundance of character into his exemplary steps. Chisato Katsura is a suitably self-absorbed cat, and Laurine Muccioli a dainty bird with a slightly precocious strut. Charlotte Edmonds is also strong as the clueless duck, whose overconfidence perhaps derives from the fact that she is not aware of her intellectual limits. In direct contrast, the Wolf and Grandfather are played by two old hands, Sergei Polunin and Will Kemp, and both dominate the stage with their muscular malevolence and doddery dancing respectively. The staging and concept are also eye-catching. Young performers play all of the ‘props’ such as the meadow (six girls with green flowing tutus) and wall (dancers holding stone blocks). There is also a slightly surreal quality to the work which sees the twelve dancers who personify water suddenly dragging the Wolf on a rope through the streets. Similarly, figures stand at times as trees of the forest in their own right, and at others as additional roots and branches to the main tree. But, when push comes to shove, the lasting impression is still of a relatively lightweight ballet that for sheer thrill cannot live with the truly thrilling turns of Les Patineurs. The Tales of Beatrix Potter certainly stands up to watching a second time in successive years, and these performances happen to coincide with a small exhibition of original Potter drawings at the Victoria and Albert Museum. The delight of this ballet, which sees animals portraying the various stories through dance, derives from seeing top notch performers moving so skilfully in thick, heavy costumes, and acting both in and out of character for their respective creatures. For example, the pigs all fall to the floor as they try to form a tight ring, but just as hilarious is the idea of these swine dancing so deftly in the first place. As I watched for a second time I spotted many new things, and several cast members, most of whom are the same as last year, stand out in particular. Ricardo Cervera is a brilliantly nimble, straight backed Johnny Town-Mouse with a particular penchant for cabrioles, while Jonathan Howells makes for quite a slick and slinky Mrs Tiggy-Winkle. Last year I felt that, excellent though Kenta Kura’s turn as Jeremy Fisher was, the basic character just wasn’t cuddly enough to steal our hearts. This year I had no such reservations, although it is still disappointing that the seminal figure of Peter Rabbit is given a relatively lacklustre routine that, unlike the other dances, lacks a beginning, middle and end. 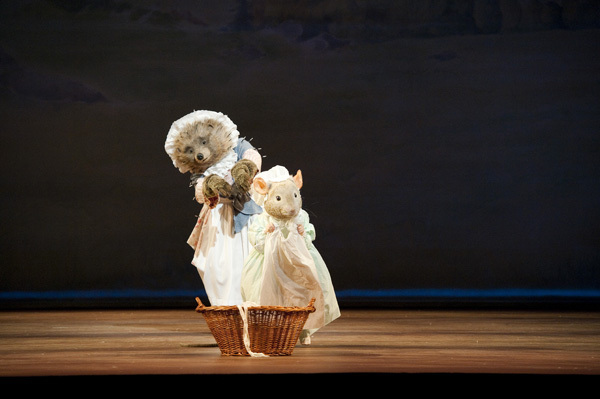 But, above all, the Tales of Beatrix Potter remains one of the most charming and delightful ballets in the entire repertoire. Make up your own mind over which piece to see it with, but just be sure to go and experience the magic. The Tales of Beatrix Potter appears with Peter and the Wolf on 14, 16 and 18 December, and with Les Patineurs for the remainder of the dates.